Hey coaches! You didn’t think I would forget about us and our planning needs did you? No way. 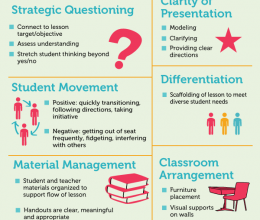 Although our planning style may be a bit different than classroom teachers, we need a good planning system in place just as much! So let’s discuss. Last year, I went the all digital route. I used iCal for monthly, weekly, and daily planning. Google docs for recording and storing information gathered in observations and debriefs with teachers. And Evernote for note taking during meetings. While there are lots of things to love about digital planning and organizing, I must admit I am a paper and pen kinda gal at heart. And this year I felt the need to show some more love to this side of myself. So I did what I love to do and created a just-right coaching planner that has made my paper and pen heart sing with happiness! Along with my Discbound Notebook , here are the materials I used to put it together. This way I’ll be able to easily refer to my monthly calendar when I’m on-the-go or doing my daily planning without having to pull up my computer or phone. If any additional meetings or events come up, I can fill them in by hand or if things get really crazy, add them to iCal and reprint. OK, on to daily planning! This is really where the rubber meets the road so you’ve got to do it right. Because I have so much going on in a typical day, I knew I needed a daily planning sheet that would help me manage my important To-Dos and scheduled meetings. I plan for the next day the night before so I’m ready to dive right in. I begin by identifying my top three priorities for the day in the “Eat that Frog” section. Then I get any other To-Dos off my mind by jotting them down in the section below that. Next I write in my agenda or schedule, balancing my time against my To-Dos. As I work, I’ll jot down any notes or thoughts that come up in the “Thought Catcher” section. Written down, these thoughts won’t distract me from my plan, but they won’t be forgotten either. At the end of the day, I’ll review these caught thoughts along with any other To-Dos that weren’t attended to and use this information along with my monthly calendar to plan my next day. Are you wondering what the heck “Eat that Frog” means? I picked it up from reading Brian Tracy’s book, Eat that Frog . If you’re interested in time management strategies at all, you should check it out. The idea comes from a Mark Twain quote: “If you eat a frog first thing in the morning that will probably be the worst thing you do all day.” Basically, take care of your most important and/or procrastination worthy tasks first! One other tool I use to map out my week is my Peek at the Week sheet. I updated the one I shared in an earlier post to better match my daily planning sheets. You can download it free here! I adjusted the size a bit and trimmed it, so that I could stick it to the back of my calendar tab for easy reference. I’m always checking to make sure that my priorities for the week match my daily plans! I’ve been playing around with my planning sheets a bit this summer and I’m psyched because I think they’re going to be so perfect for the school year. Woop Woop! After I had my calendar section all figured out it was time to decide what other sections I would add to my planner. I decided to go with Coaching, Notes, Blog, and Personal. Within my coaching section, I have tabs labeled Observation, Debrief, and Reference. I’ll store short term notes and reference material within these sections. 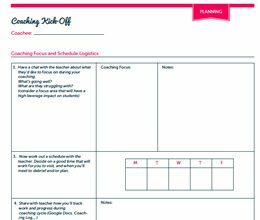 For longer term storage of observation and debrief notes with coachees, I’ll use file folders and a PD Google Site which I’m going to work on creating next week. I’ll share more on this system once I have it all put together. I decided I needed a separate Notes section for planning meetings and just to scribble out my own thoughts when I’m working on different projects. I use Levenger’s Dot Grid paper which is my favorite paper ever. Because my school life feeds the work I do on my blog, it needed it’s own section to keep all my post ideas in order. In my Personal section, I have my Meal Plan for the week along with a few other documents that help keep me together. If you would like to use my Any-Day Planner to put together a coaching planner for yourself, please visit my Etsy shop. It includes a Customized Planner Cover which you can have laminated like I did or bind together with your planning pages to make a planner for the year! If you’re someone who could do without all the daily planning action and are content with a weekly planning spread instead, then this weekly planner may better meet your needs. 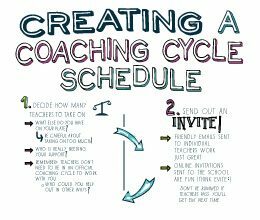 So tell me, what’s your coaching planning system? I would LOVE to hear! What did you use to make the holes for the disc bound notebook? I purchased the Arc Desktop Punch at Staples. It’s an extra expense, but I use mine all the time. I was wondering if that would work! Thanks! Excited to get started! Thanks Kristin, your organization tools are so wonderful! What size discbound notebook did you use for this? Do you still have your items available on Esty? When I click on, Visit my Shop, it says unavailable. Hi LaDonna! Thanks so much for checking in. I’m doing a bit of house cleaning in the shop, so you’ll see some of the items are still available, while others are not. Is there something specific you’re looking for? I LOVED your planning tools for helping keep track of your time and to-do’s. I’m having trouble finding these resources in your etsy shop. I was looking for the “Peek at the Week,” “My Plan for Today,” and your weekly planner. Hi Ashley! Thanks so much for your comment. While these specific planning forms are no longer available, I do have the Time & ToDo Planner, which is a nice compilation of all three forms you mentioned :) Check it out in my shop! I just put my email down to get an email for when your 2017-2018 to do/time planner is up. 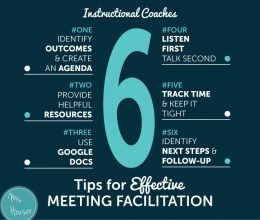 I was just hired to be an instructional coach and know I will need a paper/pen planner/calendar system too. Lots of really great ideas on your site, looking forward to delving deeper into your site, but first, to finish report cards! Thanks again for such a great site! Leave a Reply to Anna Click here to cancel reply.